It took me a while, but now I am a believer. 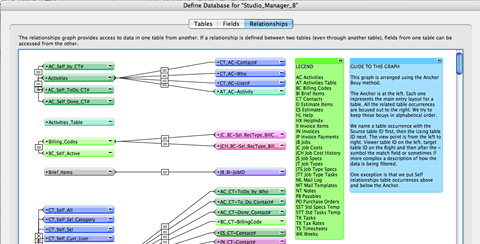 I just posted 2 notes into the relationships graph for Studio Manager 8. One note is a legend that shows what all my abbreviations mean and the other note is a general guide to how I have set-up and organized the relationships graph. I now see that these two notes should be a standard practice for any FileMaker database these days. Nice. You can pick your colors for the post-its from the color wheel, so have at it! This entry was posted in FileMaker 8, FileMaker Discoveries, FileMaker Tips on March 23, 2007 by janet.